Dijks en Bijks: Thank your lucky stairs. Confirmation from a native: "Even for Amsterdam, those stairs are pretty steep." Have-to-rotate-45-degrees-to-navigate-them steep. Trust-your-railings-with-your-neck steep. 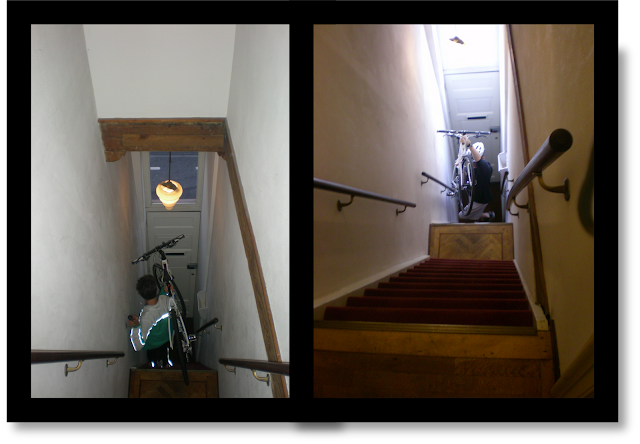 Take-a-black-eye-from-your-bicycle-handlebar-en-route-from-front-door-to-first-landing steep. Behold, the staircase, which no photograph from mine hand can do justice. Oh no! Did one of you really get a black eye from the steep stair/bicycle handlebar combo? Sorry! Also: WAY TO KICKSTART THE COMMENT PARTY! Hoo-hah!